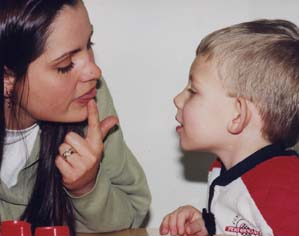 Ben Prime is a BYU graduate in Audiology and Speech-language Pathology from 2009. He is also a Graduate student in Communication Sciences and Disorders (Speech-language Pathology for those not up on their terms). He is single, modern, Mormon and incidentally, male. Read Ben's first guest post here. One of the best things about being a Speech-Language Pathology student is that regularly we get to talk to very inspiring people. Very rarely is it anyone famous. Generally they are very ordinary people who have some connection to our field. Often they are people with disabilities, or caretakers of people with disabilities. Today was one such treat. I won't go into the woman, or her disability, that’s not what matters. What matters is that you know that she has a visible disability acquired as an adult, with all the mourning and struggles that such a disability entails (which are similar to, but different from, the mourning and struggles of a disability from birth). She shared with us how her therapist had dared her to go out in public and reintegrate into her life, and how hard it was at first. She then shared with us how when she'd finally gotten to the point where she was comfortable with reemerging, a child asked her parents at the grocery store, "What's wrong with that lady?" This is where the woman becomes extraordinary. She asks the parents' permission to talk to their child and explains, "I was sick, and because of that now I have to talk differently." A very simple and honest answer. To which the child responded, "Cool! Can I try?" She went on to explain how we, as speech therapists, should encourage people in her position to speak up for themselves. She said, "In that moment when someone first asks a question is an opportunity for honesty." After the presentation, I went up to thank her and asked if I could pass on this pearl of wisdom. She said, "Please do." I feel like I've stumbled on a major theoretical refiguring of my life. Instead of seeing it as frustrating to explain the gospel, a disorder, my work, my life or anything else to someone, I can now try my best to see that first moment of questioning as an opportunity for honesty.